My best guess as to what happened between these three Otters, is that the intruding dog Otter sensed that the female is coming into season and is trying to separate her from her cub. This encounter lasted around 20 minutes but shows how ferociously the mother defends her cub. The rest of the time was spent taking still images. The encounter started when I saw the dog Otter running along the shoreline, not stopping to eat, wash, or spraint. He was on a mission. When the Otter passed the car, I became downwind of him, allowing me to get out and follow him. After looping round onto the shingle beach, I lost sight of him. After a few minutes I could hear what can only be described as a 'churruling' sound, which got more and more frantic. Crawling over the grassy rise through sheep and goose droppings, I found the source of the commotion. 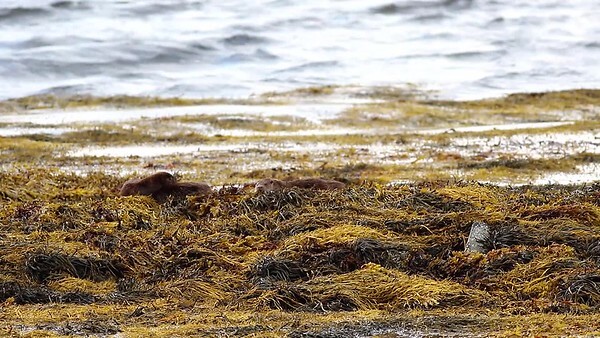 The dog Otter had run straight to a mother and cub sleeping on the seaweed. On and off for the next 20 minutes he tried to muscle his way in, but the mother was having none of it. Afterwards, the dog Otter got the message and ran off in the same direction from whence he came. Unfortunately, this was on the last evening of the trip so I have no idea what happened next. Taken on Loch Na Keal, Mull.